How to change different software languages of A-PDF to Flash after installation? Hey, I install the A-PDF to Flash with the languages by mistake. And now I want to know is there a way to change the different software languages not interface language without re-installing it. Please help. A-PDF to Flash is used for converting PDF to page turning digital publication such as e-book, e-catalog, e-magazine, e-brochure and photo album with ease. Anyway, in order to make global users can operate and take good use of A-PDF to Flash, there are 12 languages for users to choose. If you didn't select a proper language while you are installing page flip software, you can change the languages later without installation again as well. 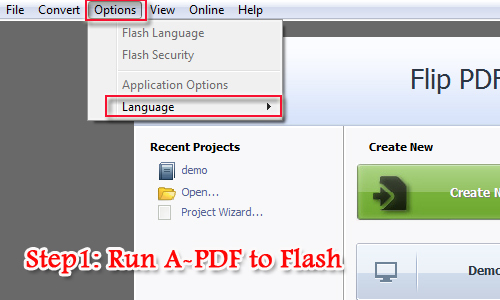 Now follow the steps to learn to change the languages for page flip software A-PDF to Flash. First of all, you should open A-PDF to flash, and then move the upper left corner. And then click the third buttons and select the last option from the drop-down menu. If you have no idea which language you are familiar, you can select the first one English first. And then it will remind you to restart to make the new language work. After restarting, then you can select your language and restart again. After you select the software language you need, you can continue to enrich flash flipbook, customize the layout and settings. 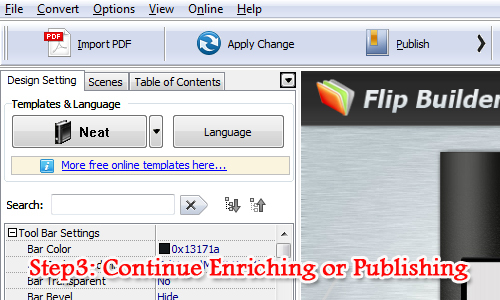 Anyway, you also can skip to enrich the page flip book and publish it online or offline directly.